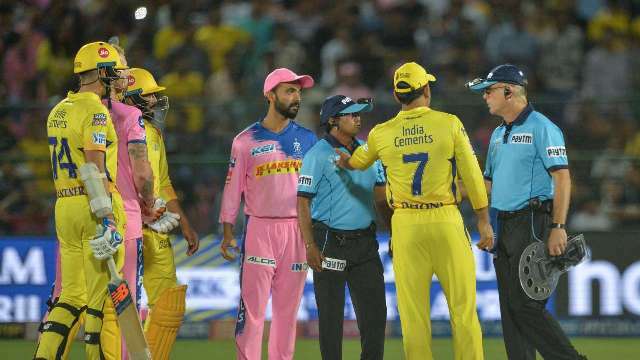 Agency, 12 April : Bispectacled Mitchell Santner smashed Ben Stokes into the stands off the final delivery to guide Chennai Super Kings to a thrilling four wicket victory in an IPL game which saw a very public outburst from winning captain Mahendra Singh Dhoni. Earlier, Chennai Super Kings produced yet another disciplined bowling effort to restrict Rajasthan Royals to a modest 151 for seven in 20 overs. Save Jos Buttler (23 off 10 balls) at the top of the order, none of other Royals batsmen looked the part as CSK skipper Mahendra Singh Dhoni’s immaculate reading of the track once again helped the defending champions.